It is June 3rd and we have raspberries! This has to be a record breaking early coming out for these delicious berries. Tonight I was out in the garden with my husband and he spotted our very first raspberries of the season. We have already devoured every ripe one, but can’t wait for even more in just a few days. If you have the space in your yard and live in the Pacific Northwest, you must grow raspberries. They are easy to grow, delicious, great to freeze, and expensive to buy from the grocery store. We have a 25 sq. ft patch of land on the side of the yard that the raspberries occupy, the perfect way to frame in a yard. Planting them along the side of the yard could also make it easy for your to frame them in using the fence (if you have one). You will need to find a way to tie them up as they get very big and start to hang over. From this point through the summer, we will pick raspberries every couple of days with plenty to eat now and to freeze for eating through the fall and winter. Enjoying delicious fruit and saving money. So pick a space in your yard, plan to plant in early Spring, and prepare to enjoy raspberries through the summer and beyond. 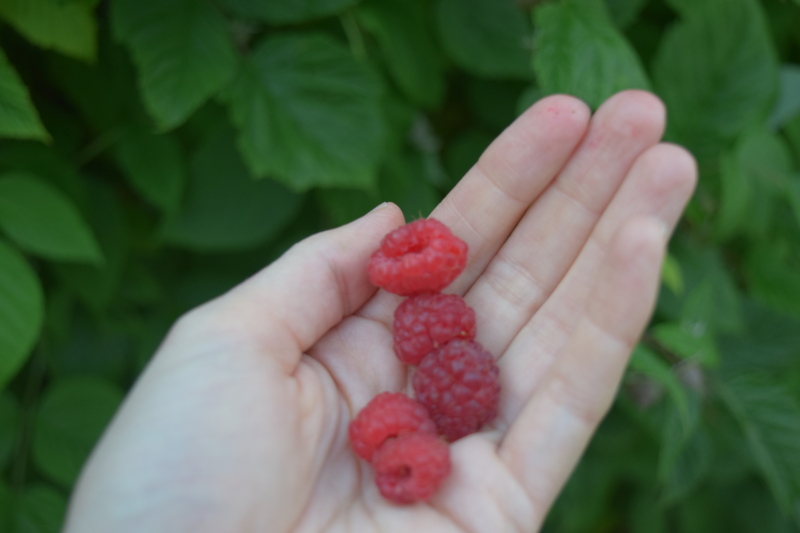 we picked our first raspberries today as well 6/3/15!!! It certainly is early for raspberries. When I freeze my raspberries, I wash them, and put them on a cookie sheet and then into the freezer. Give it an hour or two and they are nice and frozen, then bag them up so your frozen raspberries aren’t a big block of mashed raspberries. Thanks to David Hamley and the U of Maine for the advice on pruning in the middle of last winter. They look great!